The other day I was walking out of my house to take my son to school and I caught a glimpse of myself in the mirror. And it hit me. I had become ‘that’ mom. The mom I had judged before I had kids. Back then, I was the woman who knew EVERYTHING about kids… even though I didn’t actually have any of my own. But, you know, I babysat my whole life, so obviously I was a parenting expert. I am a little bit embarrassed to even write this post, since I was waaaaay off on many of my views and judgements. Here we go..
“I will never drop my kids off at school wearing my pajamas, I mean who doesn’t have 5 seconds to throw on something decent?” I will just start with the one that gave me the idea for this whole post. Before I had kids, I would go for walks before work, and occasionally I would catch school drop off. I was horrified (and quite frankly, terrified) by how some of the moms looked. I mean I would never go out in public like that. Ripped, old pajama pants, hair not even brushed… no bra!? I mean, COME ON. Well, these days I still manage to throw on a bra (or at least a sports bra) but that’s about it. I don’t get ready for work until I get back from taking my son to school, so after wrangling with a 6 year old to get him awake, fed, dressed, homework packed, teeth brushed, socks on, lunches and snacks packed… sometimes I just don’t have time to change. And I don’t really care. It does make me laugh every time I walk out of the door looking like a hot mess though. I woke up like this. Then, I went out in public like this. “Yikes, your kids sleep in your bed? I will NEVER let that happen, I am too light a sleeper… also my bedroom is for my husband and I only!” HAHAHAHAHAHA! This is one of my favorites. I was actually pretty good about this personal rule with Hudson… but Mila is way more demanding at night than he was. Both my kids sucked at sleeping, and Mila still does. We all sleep all over the place… couches, our bed, the kids bed… it’s a regular game of musical beds. 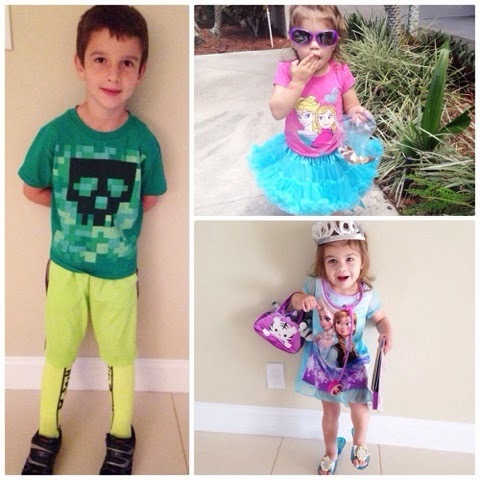 I think they look even CUTER than all those fashionable toddlers on Instagram! “Did you see her house? It’s like primary colors puked all over her living room.” I always planned on having a small area for kids toys, but insisted that my home would not look like a daycare. Well, if you have ever been to my house you know I have toys EVERYWHERE including a ‘guest’ room that is filled with kids stuff. And I like it that way. “My kids will only eat organic, and I will make all their baby food.” I did make most of Hudson’s baby food, but by the time Mila came along… I was over it. They have so many organic options now (way more than when I had Hudson) so it was easier to find healthy choices. I am not even CLOSE to being as strict with food as I once was, but I still have certain products that I always buy organic. “Why won’t that woman just pick up her screaming child?” When I used to see a mom pushing a screaming child in a shopping cart I would think, “Why won’t she just stop and calm down that baby?” Now I am often the mother getting all those stares. Mila is the queen of spontaneous freak-outs. And there is NO talking her out of it. The other day as she was screaming her way through Michael’s for no reason at all, I spotted a woman STARING at me. And I know she was thinking the same thing I did before I had kids. But there was no calming her down… if I had picked her up she would have screamed more. I ran into the same woman while checking out, and she said, “Why is she screaming?? What is wrong?” I looked at the woman, shrugged my shoulders and replied, “Uhhh… I don’t know.. because she is two?” And I went on my way. When we got in the car, Mila was happy as a clam. Go figure. “Oh my gosh, did you hear that woman? I am never going to yell at my kids like that.” I swore to myself that I would always be a calm ‘let’s talk this through’ mom. I would NOT be a yeller. Well.. here I am… that crazy, yelling mom. It’s only with my son though. I truly believe he doesn’t register what is being said to him below a certain decibel. I have tried every method, but right now, yelling is all that works. I will even say, “Hudson, I’ve asked you 8 times to put your backpack away… are you really going to make me yell at you so you will listen?” I am still trying to yell less…but I am a yeller nonetheless. So there you have it. All the super judgy things I thought about other moms before I had my own kids. I find them hilarious now. So now it’s your turn… SPILL IT!! 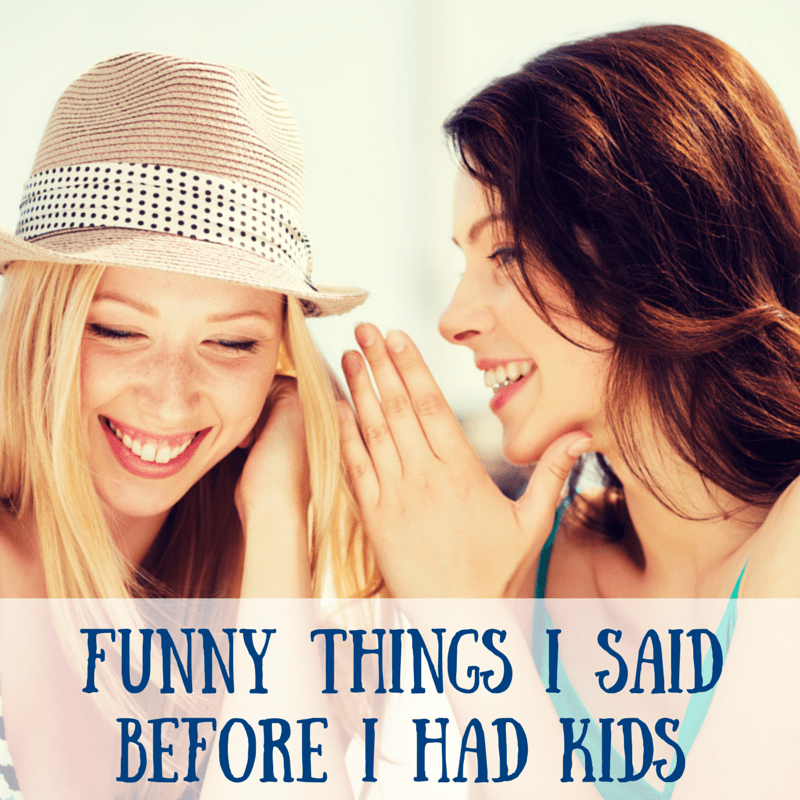 If you have kids… tell me something you thought before you had them that you are almost embarrassed to admit now that you are a mom! I don't have kids, but I SO appreciated reading your post here and chuckling to myself as I think a lot of the things you thought before kids. And your kids are super cute! I don't have children, but I can relate to some of your post. Especially the yelling mom. But, I'm not going to lie… When I'm in a restaurant and a child is screaming I give mom that side eye. Oh gosh thank you for all of this!! I am only a stepmomma right now so it's technically only a part-time gig (I am using this phrase VERY loosely as those kids are on my mind ALL the time! ), but I am already on this level. I never thought I would go out of the house looking a certain way, never thought I would let the kids out of the house looking a certain way, and definitely never thought I'd serve them some of the junk food I do in a pinch, let alone let them eat at mcdonald's on a rare occasion! But here we are. P.S. Do you have a japanese chin?? "Thats organic pizza"… Hahah love this! I always said and still say I wouldn't let my child sleep in bed with us after a certain age. My three-year-old ends up there all the time. I said something similar, that we would always take our kids out ot eat so they would get used to it at a young age. YEAH RIGHT! We never go out to eat since it's just not worth the stress of it all! I definitely remember rolling my eyes at the crying kids and scowling at the mothers if they weren't, in my estimation, doing enough to quiet their kids. I have the option of stopping at stores on my lunch break or on the way to pick up my daughter from school, so I can leave the store with a cart full if I have to when I do go with my daughter, but I realize now a lot of moms don't have that option. I am much kinder (in my head) after having kids than before. I also judged parents who let their kids watch a lot of TV. Yeah, well, my 3 year old is an expert at working the iPad or my phone when it comes to the Netflix app. This is hilarious. It is funny how having your own children can wash old expectations and judgments away in a flash. I know it! haha! Gotta love them though! Hahaha! I have thought every single one of these-and now I'm that parent! "I don't know….because she's two?" Hilarious! I'm pretty sure I would have said the same thing! Yup guilty!! 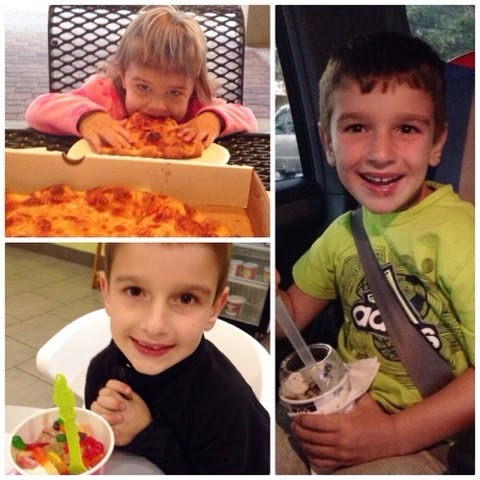 On about all of them… I did make my food for both kiddos, but mine are spaced 5 years apart. It is a lot easier to make food when the other one is at school 😉 I also agree I am a yeller with my son too, he just doesn't take me seriously unless I do! Ha! Yes! I've said my fair share of things I would NEVER do and then I had kids. All of my declarations were flipped upside down. I wrote a similar post a few years ago. My biggest one was I will never let my kids watch tv of any kind. LOL – I quickly realized that no TV = never showering again. DVDs quickly became this mama's best friend. Yes TV is a big one too.. I totally let them watch it when I am getting ready for work in the morning! And then you went and had children and it was GAME OVER. I remember thinking how easy life would be with kids… not like a piece of cake but not this damn hard. I know.. we were crazy!! I hope you have a great week and thanks for stopping over! It's all about perspective and it all changes once you have kids! So very true!! Thanks for stopping over and have a wonderful week!! 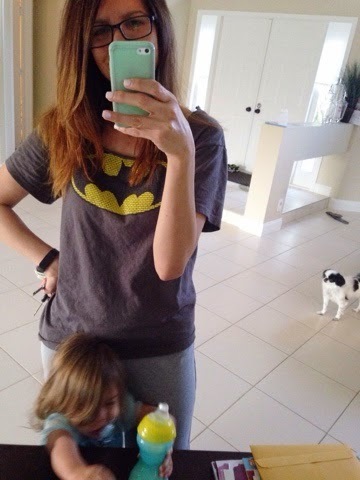 Honestly, the kids at school must think you are the coolest mom ever with that Batman shirt! I work from home on Fridays and more often then not I am dropping my kids off at daycare in my PJs and a baseball cap! And OMG, I have sooo become the mom that yells all the time and I had sworn that would never be me! I got the shirt two years ago for my son's 4th birthday party… it was a batman theme! 😉 I am glad to know I am not alone with the whole yelling thing! Thanks for stopping over and have a wonderful week!! Yes to all of these!! It's amazing how we see motherhood from the outside…once you're in the game it's a totally different world! It seems like each new milestone requires me to reevaluate how I thought I'd parent. It really is all about just getting through with as few meltdowns as possible! I am absolutely guilty of, "MY Kids will never spend that much time watching tv!" Thanks for posting. Hello from Inspire Me Monday at Create with Joy. That is such a good one, I am guilty of that too! LAUREN!!!!! SERIOUSLY!!!! YES!!!!!! To all of these!!!! At the onset, I figured I'd agree with some and not the others… *sigh* yes to all of these! My second born is like Mila in terms of sleep so our situation is the same, my daughter dresses herself in a very Disney-inspired way, yes to the screaming, yes to the organic, home made food, just yes to it all. Lol. The only other thing my "I babysit therefore I know kids" former kidless self also 'knew' is that my husband and I would go on weekly date nights. I wish that one was closer to true! YES! We will always go on date nights.. I said that too! (We NEVER go out just the 2 of us!) I am so glad you could relate!! haha what a great post! I was reading each one, shaking my head YES!! It's amazing how much things change after the first baby, then each additional…lol! Thank you for linking up with us at the Best of the Blogosphere! I have the same yelling situation with my 2-year-old, and we're in an apartment building while house searching. So I'm sure our childless neighbors think I'm the world's worst mother! hahaha I always have to yell at my son in public places, but I think its big family events that I feel the worst about!! I think I thought quite a few of those myself before my two kids. I figure everyone who has had kids can relate to that screaming kid in the store or restaurant or will one day if they do have kids and if not oh well… And I always keep packs of raisins in my purse it atleast keeps them quiet for an extra 5 minutes… Lol. Found from best of the blogosphere. Yes snacks can def help.. thats a great tip! Thanks for stopping over! hahaha I do too… sometimes. 😉 I hope you are having a great week and thanks for stopping over! BAHAHAHAAH!! Yesssss!!!!!! Story of my life! It was so just crazy as I was walking out.. I was like, "HOly crap.. this is me now!" hahaha Mommyhood does some crazy things! Yes I am always late now… always! good one girl! man, you have a lot of comments. i don;t think i've ever had so many!!! anyways, i didn't want toys to over take my house. we do an ok job of trying to hide them but it's impossible to keep up with! So funny and so TRUE!! Great post, I enjoyed it and can totally relate! Thanks Aubrey! Mommyhood makes us all crazy! I know.. I am was less judgemental these days! Thanks for stopping over! I know.. I never how judgemental I was until AFTER I had kids!! How refreshing to read this kind of post. I am so sick of the "My kids are perfect and so am I" posts. Here's what I used to say when my kids were babies: "I will never be that mom who wants her kids to move out. I'll want them to live with me forever. " Now I'm all, "I can't wait till they leave! " (My youngest is 11, my oldest is 19.) Excellent read! Oh I cant stand those post either! Parenting is great.. but it is also HARD.. and thats okay too! 😉 Thanks for stopping over and have a wonderful week! I couldn't agree more haha! I shared on FB. My husband enjoyed your article so much he read it aloud to me! We look forward to featuring you at this week's party – #17^! Motherhood is so humbling isn't it? I said almost all of the exact same things. Oops! We live and we learn. Loved all of the pictures you had to go along with this. Thanks for sharing at #MommyMeetUpMondays! I told my mom recently that karma has a funny way of finding me… Even if I don't think I'nm being judgemental about something! The only sure bet in parenting is that nothing is a sure bet! I never thought they'd be a day…or two that MY teeth didn't get brushed til afternoon!! I never thought a booger would go unwiped…IMMEDIATELY!! Or that I'd let my kids eat straight off a restaurant table either. Totally on point with all of these! But I have to admit, Brian and I were very realistic. We knew we would have toys everywhere. We knew the kids would sleep in our room. I did make all their baby food… for both. I love watching my sister go through this right now. It's just hilarious. I probably agreed with 90% of all the things you said until I had children. In fact I once said I never wanted kids. I was the first of all of my friends to become a mom. If was frustrating for years dealing with all the judgement from friends who had no clue what I was going through. Now that they all have kids, I just laugh to myself as I watch them eat their words. FYI my kids are 15 and 6 (both girls), and they both still sleep in the bed with me way too often, and when not with me they must sleep together. These are hilarious! I don't have kids yet, but run summer camps & afterschool programs for work & a lot of things I thought I would do totally went out the window! I can only imagine what it will be like when I have kids! Ha ha yeah- been there and thought them all too. On the other side of it I've vowed never to judge another mom because you simply never know what they are going through. Well put! Pinning! Too funny! I don't have kids but a lot of these make sense as to why you'd end up ignoring them – especially the screaming kids one! LOL I love this post! The only perfect moms are moms who don't have kids yet! I love this post!! I have two really good friends that just had their first child and they were so judgemental while they were pregnant and it is so funny to see them now that they have a baby. I can't wait to go through it! This cracks me up because it's so me too. I have a three month old and I'm already kicking myself for thinking that babysitting somehow prepared me for the 24/7 grind of being a mom. Also, and unrelated, I'm heading back to work in three weeks as a first time mom and am just scared out of my mind for how awful it's going to be. Your blog was the first one that I found for working moms, and I often look back at your first post for encouragement that we're making the right decision, though I know it's going to be so hard. So, thanks! Ha ha I knew this post would make me laugh and I was right! I never thought I would wear pj's, no bra, unbrushed teeth dropping my daughter off in the car drop off line at her school..totes that Mom! Bahahahahaha yes! To all of it! I totally judged other moms this way before I had kids! And now… I'm for sure being looked at by young women who have yet had the joys of eating pizza with their kids in a messy house while watching tv and wearing their pjs… at noon! Thanks for sharing! “Uh I don’t know, because she is two?” is the best response ever! Made me laugh. I think I have said most of these as well. I have done things I said I wouldn’t do and I have judged others for it as well (we are human!). But good to recognize that we are all in this together! This is so funny haha! Thanks for sharing! This was funny. Thanks. I am scared so many of the things I said are going to come back and haunt me.